One of the interesting facts about downtown Lodi, CA is that there is an underground tunnel system that connects many of the bars, stores and restaurants together. In studying the history of Lodi, I've learned that these tunnels were in place to move alcohol underground during Prohibition between 1920 - 1933. Today, secret sidewalk access points are still used to give easy access to delivery of goods to these bars, restaurants and stores. Pretty interesting stuff! During Prohibition, Lodi was the supplier of grapes for wine that would be produced in Chicago. Lodi’s downtown area has a train system that transported grapes from Lodi to Chicago under cover. Chicago is where Al Capone managed a successful business called "the Mob" that imported and sold beer and wine during the 1920s. Capone's mob made $60 million a year. His mob was a source of great wealth and attracted violence from competing mobs who wanted in on the action. In 1893, Reverend Hyde Russell founded the Anti-Saloon League (ASL), a group whose motto was "the Church in action against the saloon." By the late nineteenth century most Protestant denominations, and the American wing of the Catholic Church, supported the movement to legally restrict the sale and consumption of alcoholic beverages. These groups believed that alcohol consumption led to moral corruption, prostitution, spousal abuse and other criminal activities. By 1920, the 18th Amendment, deemed "the manufacture, sale, and transportation of alcoholic beverages in the United States and its possessions" illegal. (Thank you Wikipedia.) Instead of drawing people into a closer relationshp with Jesus, this "religious" movement ultimately caused even more violence and corruption as "the Mob" gained power and influence. "Listen, my son, and be wise, and set your heart on the right path: Do not join those who drink too much wine or gorge themselves on meat, for drunkards and gluttons become poor, and drowsiness clothes them in rags." Now, don't get me wrong. This passage is full of wisdom, because drunkenness can sometimes lead people to do stupid things that hurt themselves or others, not to mention, alcoholism is a real disease that can harm individuals and entire families, but when was the last time you heard an evangelical pastor talk about eating too much meat? Not me! Why this matters to us? The reason I'm writing about this is because Beck and I find ourselves in a weird paradox that I would like to explain. Beck and I are two people who went to college, are Christians, love Jesus, live in wine world, drink a little wine, have never been drunk in our lives (truly), and find ourselves living on a vineyard, growing grapes for one of the biggest wineries in the world, and trying to launch a gift and wine company. Given our conservative church background we have struggled with thoughts of "are we doing the right thing here?" We decided to go to the Bible and see what it says, and not listen to a mediator, pastor, author or denominational views on the subject of drinking. Over the last few years our ears have become much more attuned to mentions of wine or vineyard-related parables in the Bible. We find them throughout the New Testament. 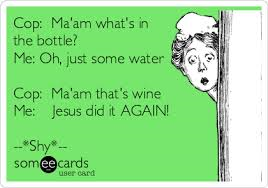 As I really started seeking out wine-related scriptures, I discovered that many of Jesus’ biggest moments in life involved wine. Jesus’ first miracle was creating water into wine at a wedding reception. Jesus’ last supper with his closest friends involved eating bread and drinking wine. Jesus’ last moments with his disciples were in a vineyard where he said, “I am the vine, you are the branches.” He referred to his father as the farmer or “grape tender.” When Jesus was carrying his cross he was given wine. When Jesus was on the cross he was given wine vinegar. It says in Revelation that God is the "great wine maker" and someday we will have wine and celebrate with Him in heaven. When I began to see how important wine was in Jesus' days, I suddenly became free of the thought that alcohol is "bad" and realized that this notion that I received growing up in the church is really the result of Prohibition’s influence, not anything actually rooted in Biblical authority. Despite this new revelation, I still had the question of, why wine? Why God am I in the wine business? Why is wine special to you? I believe God still speaks if we stop long enough to listen, so I asked Him this, and He answered me with another question, “What is wine?” I thought about this. “Wine is the derivative of rotten grapes made into a drink.” Then I got my answer. Jesus takes the rotten things in our lives and creates something delicious with it. Something worth celebrating. This happens when we come into a relationship with Him. God likes wine because it’s a reflection of who He is. The Prohibition movement wasn't wrong, necessarily, but they were wrong in their approach. You cannot get people to become more "Christian" through righteous rules and Bible thumping. It's only when they get to understand who the righteous one is that transformation takes place. For us, we believe that happens when we get to know Jesus. Have you ever thought about what God does for a living? I believe He is in the business of taking our rotten grapes and making us into delicious wine. Not because we deserve it, but because God is love and He loves us. Jesus is also the inspiration for Fête because He is our source of joy when we feel like we can’t choose it anymore. When the bad days or bad news comes, we still find comfort and a reason to celebrate, because we put our trust in Jesus. All we have to do is decide each day to choose Him. That's our heart, friends. We know that many of you have different philosophies on life and God, and we may not agree on everything, but I hope we can all agree on one thing - life is precious. Let's celebrate it!